Since my very first taste, too many years ago to admit, I’ve been wild about Hot & Sour Soup. I think I order it whenever it’s available on a menu and it’s always exciting for me to sit at the table of a new restaurant, just waiting for their Hot & Sour Soup (which is always my first course) wondering what theirs will be like. You never know what you’ll get until you try it. It may be very refined and have just a few thinly sliced, elegant ingredients or be chock full of stuff. Hot and Sour Soup might be very thick or very thin or somewhere in the middle, and very spicy and sour, but perhaps not. It’s almost always delicious, though! There’s usually day lily buds, bamboo shoot and mushrooms of some sort, and the mushrooms may be dried or fresh or a combination. Often there is tofu, sometimes very thinly sliced carrot and occasionally celery. Usually, I’ll see whisps of egg floating around, but not always. All this variety holds true when searching out a recipe – when I first made Hot & Sour Soup, years ago, I was only able to find one recipe in a rather battered 2nd hand store Chinese cookbook – now there’s an overwhelming amount of recipes to choose from. The basic recipe, though, is very simple, especially if you start out with a good store-bought broth or have Home-made Broth in the freezer. And while I always like Hot and Sour Soup, I also have some have some definite opinions on what makes a great one. I’m sure you do, too, and that’s why making your own should produce your favorite soup. What’s available in your store may have to shape the final product unless you’re willing to search out ingredients. Luckily, there’s plenty of room to play with ingredients and still have an excellent soup – even better, Hot and Sour Soup is by nature rather low-calorie and good for you, too! Winter’s coming on and it’s a great time to think about cozying up to a cup or a bowl. It will warm you from the inside out. 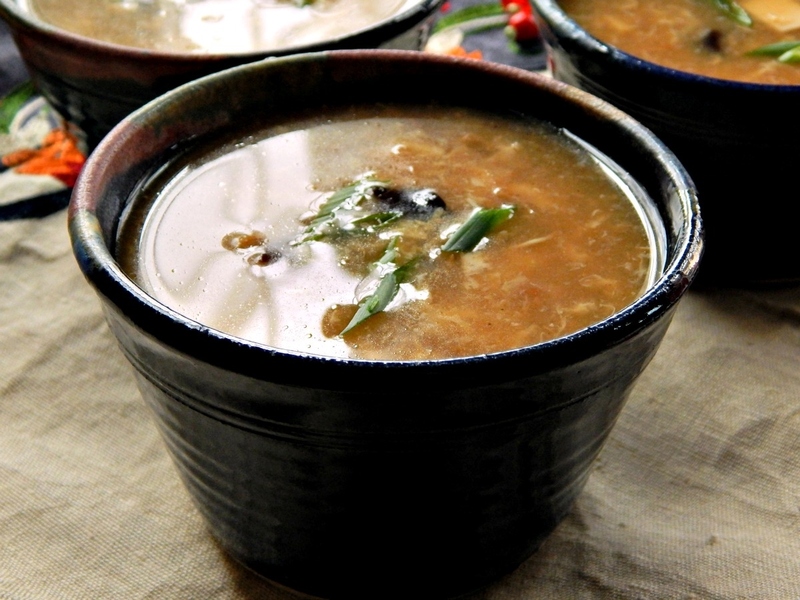 Heck, you might even wish for your first cold of the season; Hot & Sour Soup is said to have restorative properties. Okay, so that’s going too far, isn’t it! Soak tree ear mushrooms in enough boiling-hot water to cover by an inch, about 30 minutes. Tree ears will expand significantly. Strain, cut into small pieces if large, and trim off and discard any hard nubs. In a small bowl, toss pork with one tablespoon cornstarch, set aside. Have all ingredients ready. Bring chicken broth to a simmer, add soy sauce, sugar, ginger, garlic powder, cayenne pepper. Mix 2 tablespoons of cornstarch with a little water to form a slurry. Add to soup while stirring to prevent clumping. Add the pork and any cornstarch to the simmering soup, stirring as is it added. Immediately add tofu, then add the mushrooms, daylily buds and bamboo shoots. The soup should thicken quite quickly, but working fast helps to ensure the thin slivers of pork don’t cook to a hard state. Add the eggs in a steady stream, very slowly stirring as they are poured in. Turn off heat and right before serving, add the vinegar, sesame oil and white pepper. Taste and adjust any seasonings to your liking. Garnish with green onion. Pass a little extra white pepper and vinegar, if desired, for those who wish to add to the soup. I have often made this without daylily buds and it is still perfectly good. Note that I have used powdered ginger and garlic both for intensity of flavor and to keep the broth clear. The vinegar, white pepper and sesame oil can diminish quickly, so they’re added right before serving. J. Kenji Lopez (link below) recommends dark Chinkiang (a.k.a. Zhenjiang) vinegar – it’s not readily available in my area so I went with his suggested substitutions. Feel free to add your favorite ingredients – or remove any of mine! Sliced button mushrooms, shiitake, carrots, etc. This soup can be made without the pork. I have actually used left over pork ribs or barbecued pork shoulder in this recipe with fantastic results. Leftover tofu and bamboo shoots may be used in a stir fry or frozen to make another batch later. I want to thank Bruce Cost for his recipe in Epicurious, J. Kenji López-Alt for his article and recipe on Serious Eats, and the Woks of Life for their lovely recipe. I pulled some elements for my soup from all these recipes. This entry was posted in Click here for Bargain Meals, Click here for Fabulous Food Posts and tagged Asian, Bamboo Shoots, Bargain Meal of the Week, Chicken Stock, Easy Recipe, Eggs, Frugal Hausfrau, J. Kenji López-Alt, Leftovers, planned leftovers, Pork, Pork Shoulder Recipe, Soup, Tofu. Bookmark the permalink. This is my absolute favorite kind of soup, and surprisingly very hard to get right when making at home. Yours looks delish!! Thanks Anjana! I loved all the experimental ones that led up to this, too – but this one, for me, is it! Yummy this sounds and looks so delicious! I think it’s so perfect here for fall, but good anytime! Thanks! Mollie, this soup sounds heavenly (especially on a cold, dreary Monday). Thanks for bringing it to TBT # 12. Thanks, Meaghan! I’m excited to be a new co-host along with you and Quinn and Alli! This is one of my favourites going back years. I loved the one they used to serve in the Orchid restaurant on Dublin’s Pembroke Road. Fond memories. Thanks, Conor, but you’ve been known to throw down a few Asian recipes on your blog (I’m still drooling over some of them!) so maybe you’ll recreate it for us! Very interesting recipe. I’ll have a bowl please! I made my first hot and sour soup back in the 1980’s after a Chinese cooking class which I also bought the chef’s cookbook. Need to look at your updated version which I am sure has changed since then. Hi Juju, I was surprised at how close it was to my old recipe, but I did add in a few special touches. Of course, here I did start with a broth that was already made. It would be fun to see your version! I absolutely love hot and sour soup. Fabulous recipe. Given how much I love it, it seems a bit silly not to have made it myself! Thanks, Virginia! I am never quite satisfied that I don’t have daylily buds, but honestly, I think a lot of restaurants don’t use them, either – other than that minor little pang, I love this soup! Thank you for combining several recipes to come up with the best. This is one of my families favorites (even for tofu haters). Thank you for posting. I’ve pinned it for nights when we don’t do take out. Well, Liz, maybe you’ll never want to do take-out again!! 🙂 And thanks for the lovely compliments! Lol Mum! The skies opened up yesterday and spit out icy snow pellets – wind so hard it was blowing sideways and then the sun came out and it went away. Makes me shudder just to think of what’s to come! I love that this is a recipe you could keep a bit mild and then the adults can add more pepper and vinegar to taste! One of my favourite Chinese soups to make at home. 🙂 I’m just nuts about it! 🙂 Have you shared your version, yet? WOW… looks delicious!! I am coming over tor dinna! 😀 Thank you for sharing!